Sea Yourself Fully Ocean Front-watching Sunset N Rainbows over the blue Pacific! Direct Ocean Front condo at the Valley Isle Resort in Kahana. 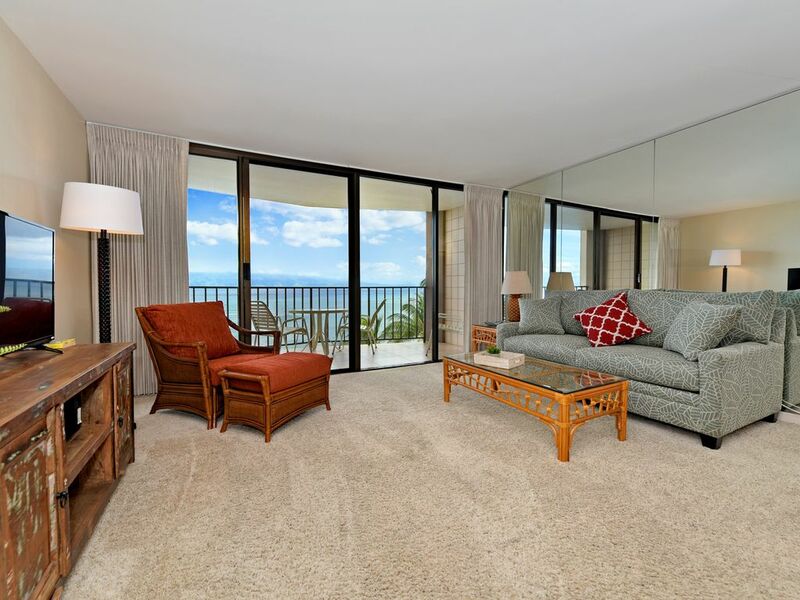 Enjoy ocean front views from the lanai off of the living room. A TV coupled with the DVD player keeps you entertained in the evenings. Kick back on the private lanai with morning coffee or sunset mai tais! Bring your CD's from home and listen on the player provided. Keep your valuables secure in the in-room safe. back and don't eat the whole time! The Valley Isle Resort is located just seven miles north of the historic whaling capital of Lahaina in West Maui. Centrally located at the heart of Kahana where you can unwind as you swim in the warm ocean, or just relax on your private lanai. Enjoy the convenience of walking to dining, shopping, activities and beach rentals. Living room faces the Ocean - Wake up to sounds of waves with an Oceanfront view! Best Vacation Ever! This is one of the best vacations we have had in years! Valley Isle is situated in Kahana on the west end of Maui between Lahaina and The Ritz. Very quiet area but close to everything. Bus route stops right in front of the Valley Isle in both directions. Sunset bar and restaurant, The Beach House is right next door, Maui Brewing Company in walking distance. #609 very clean and spacious with a full kitchen for the kick back cooking days. Beautiful white sandy beach, awesome sunset every night right off our balcony. Take the 20 minute bus ride into Lahaina for all ferry and boat excursions, shopping and dinner. We couldn’t have been happier. Thanks Chase N Rainbows! We will be back! Lowella D. Arrived June 28 to July 4: Love this place! We would stay here all over again. Super clean, comfortable and the view, OMG! We came to Maui during summer peak time and this place is away from the crowd but close enough to drive to Lāhainā. No rowdy kids running around and in the pool. My kids loved it here as well. They didn’t mind being in the room bc it was so comfortable for them. Our morning walks along the beach was amazing. Book Early! With these Fantastic Views! We book in Advance! Close to Dining*Shopping*Golf in Kaanapali! Chase ‘N Rainbows (CNR) Real Estate, Inc. is a Maui based, family owned company established in 1980 with two divisions: vacation rental management and real estate sales. For the past twenty years, CNR has been offering visitors and Kama’aina alike, affordable and luxury accommodations at a very competitive price. All of its vacation rental units are carefully selected, meticulously inspected, attractively furnished and well maintained to the highest standards. CNR is committed to providing the finest product and unsurpassed personalized service in the industry. These condominiums come highly recommended by leisure, business, and family travelers with distinctive tastes. A significant number of satisfied, return guests speak for the company’s service commitment and quality product. Chase ‘N Rainbows is a proud member of the Hawaii Visitors & Convention Bureau (HVCB), The American Society of Travel Agents (ASTA), Maui Visitors Bureau (MVB), Hawaii Association of Realtors, Maui Chamber of Commerce, and Vacation Rental Managers Association (VRMA). Consistently voted the #1 island in the world, Maui has endless activties for vacationers, from fabulous beaches to fantastic dining and nightlife! Located on the northwest side of the island, Lahaina is a tropical paradise blending a rich history with modern Maui. Chase’ N Rainbows Real Estate offers you the finest collection of hand-picked Maui condo rentals in the popular areas of West Maui. Come see all that Maui has to offer! A sunset cruise around the island makes for a perfect romantic evening. If you’re curious about what goes on under the waves, snorkeling tours are a great way to view the incredible variety of life that lives under the surface of the ocean. If you don’t want to get wet, there’s even a submarine that can take you into the deeps while you view its mysteries from the comfort of a warm cabin. Helicopter tours are an excellent way to take in views of the whole island, including incredible waterfalls, sea cliffs and forests you would be hard pressed to view on foot. For those looking for a little more excitement, you can take an ATV tour or Zipline adventure, drive the road to beautiful Hana or watch the sunrise from Haleakala. Enjoy Maui's fabulous restaurants, shops, art galleries and spas! Beds are made up for arrival. 6 bath towels, 4 hand towels, and 4 wash cloths are provided. Come see all that Maui has to offer! A sunset cruise around the island makes for a perfect romantic evening. If you’re curious about what goes on under the waves, snorkeling tours are a great way to view the incredible variety of life that lives under the surface of the ocean. If you don’t want to get wet, there’s even a submarine that can take you into the deeps while you view its mysteries from the comfort of a climate controlled cabin. Helicopter tours are an excellent way to take in views of the whole island, including incredible waterfalls, sea cliffs and forests you would be hard pressed to view on foot. For those looking for a little more excitement, you can take an ATV tour or Zipline adventure, drive the road to beautiful Hana or watch the sunrise from Haleakala. Enjoy Maui's fabulous luaus, restaurants, shops, art galleries and spas! Clean conveniently located condo with a superb view of the ocean and Molokai. It worked well for the two of us. Patio door could use some work, but everything else was fine. Neat, clean condo with a beautiful sunset view. Everyone that we had contact with were very friendly. Everything that we needed was within walking distance. We've partnered with the top rated beach rentals and activities concierge in Maui—The Snorkel Store. With a 5-star ratings for both Yelp and Trip Advisor, The Snorkel Store is Maui's one-stop-shop for snorkel rentals, beach bundles, and the guaranteed lowest rates for things to do on Maui. Use the special code RAINBOWS at checkout to take an extra $10 off your order, and don't forget to grab your free beach map—customized based on the conditions during your stay—when you're in the store. Drop-in to one of the three Snorkel Store locations to get the custom-fit experience everyone is raving about online.